Welcome to the 2017 football season and our first edition of The Pick List. Each Thursday throughout the regular season, The Pick List will feature six of the best match-ups across the state, and make our predictions on a handful of other games. The Blue Valley Tigers face quite the challenge to start the season as they open against Class 4A Division I’s three-time defending state champion Bishop Miege Stags. However, Blue Valley’s challenge involves more than just football. It will be the Tigers’ first game since the shocking death of their coach, 43-year-old Eric Driskell, in February. Driskell led Blue Valley to a 70-17 record with two state titles and two straight Class 6A runner-up finishes. Allen Terrell, who was an assistant coach under Driskell, takes over the program. In addition to preparing his players for what is sure to be an emotional start to the season, Terrell also must prepare a young squad to face a perennial power in Bishop Miege. The Tigers return only four starters from last year’s team that finished 12-1 and fell 17-14 to Derby in the 6A title game. The list of graduated players includes five All-State players in quarterback Matt Dercher, running back Will Evans, wide receiver Harrison Van Dyne, offensive lineman Kirrian Kirby, and linebacker Michael Maffry. Blue Valley’s returning starters are Blake Brown at wide receiver and cornerback, defensive backs Owen Wilson and Eric Olson, and defensive lineman Sutton Williams. There’s no doubt the Stags will be ready to test a young Blue Valley squad. Bishop Miege returns five starters on each side of the ball from a team that finished 12-1 last year. Miege’s only loss last season was a 35-28 defeat to Blue Valley to open the season. Senior quarterback Carter Putz returns afer passing for more than 3,000 yards in each of the past two seasons. He needs only 2,410 yards this year to become the state’s all-time leader in career passing yards. After throwing 50 passing TDs last year, he needs only seven more to earn that state record as well. Brison Cobbins returns at running back after rushing for more than 800 yards last year. Buhler is 3-2 against its Ark Valley Chisholm Trail Division III foe McPherson dating back to 2012. However, four of the last matchups have been close. Buhler won 44-28 in ’15 and 26-13 last season. McPherson won 44-42 in ’14 and 44-28 in ’12. 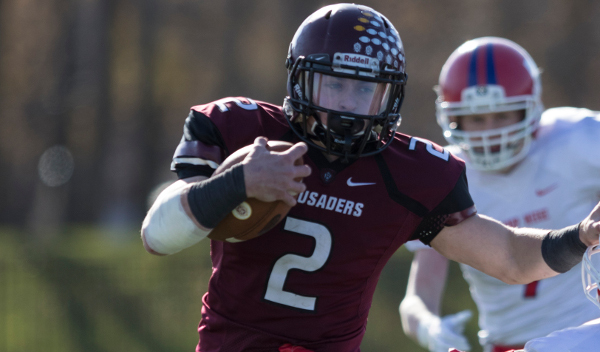 Buhler, with few returning starters last fall, went 11-2 and advanced to the Class 4A-I state championship game before falling to Bishop Miege, 53-21. McPherson (8-3) advanced to the quarterfinals with a great defense. Buhler had an average score of 34-21, while the Bullpups’ average score was 31-12. McPherson finished second behind Miege in 4A-I scoring defense. McPherson lost to Buhler and Maize South to open the year, then won eight straight before a 35-27 loss to the Mavericks. Buhler then beat Maize South, 27-7, in the sub-state title game. The Crusaders, long known for its excellent ground attack under coach Steve Warner, delivered 387 total yards a game, including 286 on the ground. Buhler has averaged at least 29 points in a game in each of Warner’s 11 seasons. Senior running back Dalton Brown, the AVCTL Division III MVP, finished with 1,967 rushing yards and 27 total scores. The line is experienced and talent-laden, especially with seniors Braden Rose and Brendan Webb. Rose and Webb combined for 15 sacks, and Rose set a school record with 32 quarterback hurries. Buhler allowed just 59 rushing yards a game. McPherson enjoyed a nice improvement under second-year coach Jace Pavlovich, the former defensive coordinator under previous Bullpup coach Tom Young. The Bullpups went 5-4 in Pavlovich’s first year before the three-win jump. The Bullpups rushed for 184 yards a contest and delivered 341 total yards a contest. Standout quarterback Casen Hoover (35 TDs accounted for) graduated, though the Bullpups have plenty of depth in the backfield with senior Tyson Stites and junior Jace Kinnamon. Many of the top defensive players return, including three first team all-league selections with defensive back Drew Labertew, linebacker Jayse Alexander and lineman Wyatt Seidl. The trio are all seniors. This could easily be the first two of matchups this season. Buhler has a little too much on offense. After winning their third consecutive state title, the Rossville Bulldawgs will have to replace many of the players who played a big role in the championship run. Rossville will be without a trio of All-State performers in quarterback Jacob Bradshaw (1,774 passing yds, 25 TDs; 2,734 rushing yds, 31 TDs), wide receiver Cole Schumacher (61 rec., 1,158 yds, 21 TDs), and linebacker Dawson Hammes (172 tackles). The Bulldawgs’ lone returning starter on offense is running back Perry Foster, who rushed for 724 yards and nine touchdowns last year. Senior Sheldon Hulbert is expected to take over at quarterback. Defensively, Rossville returns four starters, including Hulbert at linebacker. But while Rossville will be trotting out a lot of new faces on the field this Friday, there’s no doubt the experience and expanded practice time from the last several postseason runs will bode well for this team. Marysville returns six starters on offense and five on defense from a team that finished 7-3 last year, falling 28-20 to Norton in the first round of the Class 3A playoffs. The Bulldogs will be led on offense by senior quarterback Jack Blumer, who passed for 1,372 yards and 16 touchdowns last year. However, Marysville graduated All-State all-purpose player Hunter Warnick, All-State defensive lineman Greg Martin, as well as its leading receiver in Jayton Haggard. Rossville scored in the final minute to defeat Marysville 27-20 to open the 2016 season. Hesston opened the 2016 season 1-3 and enjoyed a great run to the Class 3A state championship game before falling 48-42 to Rossville in overtime and finishing 10-4. In 2016, the Swathers lost the opener to Garden Plain, 33-27, after falling, 22-21 in overtime, in the playoffs to the Owls the year prior. Last season’s game featured both teams with more than 445 total yards. Since ’05, Hesston is 0-5 against Garden Plain, the only team in that span the Swathers have played more than twice and not beaten. However, four of the five meetings are within eight points or fewer. Hesston coach Clint Rider went to Blue Valley Northwest and former Sterling coach Tyson Bauerle takes over. The Swathers graduated its all-state duo of quarterback Zach Esau and wide receiver Zach Vogt, but return plenty of an explosive team. Junior Parker Roth finished with 196 carries for 1,270 yards and 21 scores. Junior Cameron Cox, who had 866 receiving yards, steps in at quarterback. Senior Reese Nebel is expected to step up at receiver, along with a veteran offensive line, including seniors Jesus Ramirez. Hesston has traditionally has very explosive offenses. The Swathers have made the playoffs every year since 2010 and averaged 33.1, 32.8, 34.6, 39.8, 46.5, 32.6 and 37.6 points per contest in those years. Bauerle turned around Sterling, including 37.6 points per contest on a 6-4 season last fall. Garden Plain finished 10-2 with an average score of 34-21 that included multiple close victories. Garden Plain, second all-time in Kansas history with 32 playoff appearances, defeated Wichita Independent, 12-7 in the first round of the playoffs. After a 34-20 win against Halstead, the Owls fell 49-8 to Hoisington. Garden Plain graduated all-everything standout Nate Pauly. He passed for 525 yards with a 5/3 TD/INT ratio. Pauly rushed 170 times for 1,522 yards and 28 scores. He contributed 388 special-team yards. The Owls return six offensive and five defensive starters. Senior linebacker Nick Dooley is expected to lead at running back and linebacker. He rushed for 393 yards last season. Hesston has come very close to beating the Owls. This year, behind Roth’s playmaking and the veteran line, the Swathers earn the win. Plainville, unranked in the ‘16 Class 2-1A preseason poll, started one of the state’s most surprising seasons with a 20-16 season-opening home win versus Mid-Continent League foe Smith Center, then ranked No. 1. In sub-state, the Cardinals again played the Redmen at home and earned a 14-0 victory before falling to Troy in the state title game. Smith Center has lost in the sub-state title each of the last two years. This year, Smith Center is again No. 1 behind its veteran line and duo of all-state players with lineman Dalton Kuhn (80 tackles, 15 TFLs) and defensive back Colton Hutchinson (94 tackles), who is expected to start at quarterback again this season after playing there much of last year following an injury to Thayne Benoit. Defensively, Hutchinson has eight interceptions in the last two years. Smith Center led the classification with 10.6 points per contest, while Plainville ranked second at 11.5 points permitted. The Redmen (9-3) tallied 34.6 points a contest, and the 11-2 Cardinals scored 38.2 points a game. Smith Center, which gets Plainville, Phillipsburg and Norton at home this season, held a perfect home record last year. Since a 36-14 loss to Beloit in Week 2 of the ’13 season, Smith Center is 19-2 at home with both losses coming to Phillipsburg in ’15. The Redmen averaged 287 rushing yards a game, including 665 and 12 scores from senior Trace Haven, both team-highs. Senior Brett Meyer returns after 20 catches for 458 yards and six scores, all easily Redmen bests. The Redmen had just nine turnovers and were plus-17 in turnover margin. In addition to Kuhn, the Redmen line returns senior Avery Hawkins, Camden Dietz and Austin Hobelmann. Plainville had significant graduation losses at the skill positions with losing all-state quarterback Hayden Friend, along with fullback Riley Nyp and wide receivers Ryan Buresh and Justin Reif. Friend passed for 2,039 yards with 28 scores, and rushed for 1,268 yards with 18 TDs. Nyp delivered 1,539 rushing yards and 22 rushing scores, and Buresh and Reif combined for 19 receiving TDs. Sophomore Jordan Finnesy is expected to step in at quarterback. However, Plainville has a very experienced line and multiple key players back on defense. Senior Hayden Gillum delivered 97 tackles with 14.5 TFLs, and sophomore Jared Casey enjoyed a standout freshman year with 96 stops. Senior Noah Hansen had 64 tackles with 7.5 TFLs. Plainville forced 34 TOs and was plus-21 in turnover margin. Just like last year, this could very easily be the first of two meetings. Smith Center gets a slight edge with its experience at the skill positions and playing at home. 8M-I No. 2 St. Francis at 8M-II No. 4 Sharon Springs-Wallace Co.
For the second straight season, this is a Week 1 Northwest Kansas League battle of top-five teams. Last year, St. Francis won, 22-20, in one of the wildest games of the regular season. The Indians went on to finish runner-up in Eight-Man, Division I, while Sharon Springs-Wallace County earned sub-state runner-up for the third straight fall in Division II. In basketball, many of the same players helped St. Francis finish fourth in Class 1A, Division I (best finish in school history), and Wallace County won the Division II crown. In last year’s opener, St. Francis scored on a Hail Mary to end the first half that tied the game at 14. After a second-half TD, the Indians had their final points when St. Francis lineman Trayton Doyle had a sack in the end zone for a safety. With less than six minutes to go in the contest, Wallace County’s Carlin Springsteel returned an interception 35 yards for a pick-six. Wallace County converted the 2-point play, but it was called back because of penalty. The Indians stopped the Wildcats on the second try. On the final play of the game, St. Francis lined up in punt formation. Cravens took the snap but instead of kicking, tight roped down the sideline and ran out the clock, a key play in coach Rodney Yates’ eyes. St. Frances is 10-1 and 11-1 in the first two seasons under Yates. Wallace County has made the playoffs the last 11 seasons. Kevin Ayers, the head coach from ’06-13 and an assistant last fall, is back as Wildcats’ head coach as Jeff Hennick moved to Oakley. Both squads are excellent defensively. In the last two seasons, St. Francis has collectively permitted 10.9 points per contest, best in eight-man football. In the last three years, Wallace County has permitted 15.3 points per contest, fourth-best in eight man. St. Francis returns senior Tate Busse (588 receiving yards) and sophomore Brady Dinkel is expected to step in at quarterback. Junior Jordan Raby, the team’s leading tackler with 92 stops, will take over as the feature running back. The Indians were plus-25 in turnover margin. Doyle had 11 TFLs and helped St. Francis tally four defensive/special teams scores. Ayers expects to use multiple quarterbacks, including Springsteel, a senior, and the Johnson brothers: senior Seth and junior Luke. Seth Johnson led the team with 510 receiving yards and collected 93 tackles (second-highest), while Springsteel picked off a team-best seven passes. Wallace County is excellent in two other categories: few turnovers (eight all year, plus-11 in TO margin) and kickoff return. Wallace County had five defensive/special teams scores last season. Seth Johnson finished 11th in eight-man in kickoff return average (21.5). St. Francis graduated its all-state tandem of Cravens and running back Taylor Rogers but returns a bevy of talent, including Doyle, another all-state player. In 2016, St. Francis had a roster more than twice the size of Wallace County and has a similar advantage this season. Wallace County will keep the game close with its defense and special teams, but the Indians’ overall speed and depth will allow St. Francis to earn the road win.